ASDF Headquarters has now announced the new set of Office Bearers East India Region which will be headed by Asha Ambhaikar from 2015 to 2020. Officially announced by the ASDF International President and directed by Office of the International Secretary. Association of Scientists, Developers and Faculties incepted in 2010 has now landed in East India (EI) region with full fledge from January 2015. The Governing Council under the leadership of visionary leader Pr. 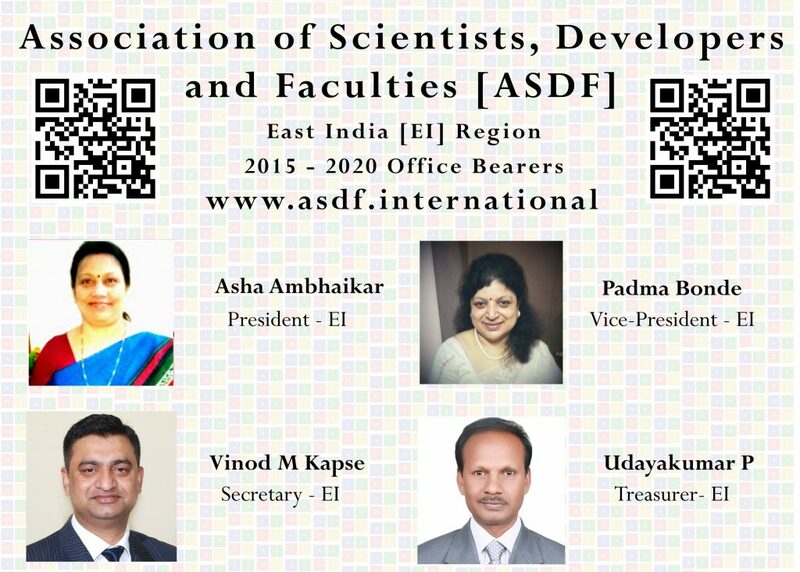 Dr. Anbuoli Parthasarathy has unanimously selected the office bearers of ASDF EI Region which has got resolved in the board with fullest support. The span of the office bearers from 2015 to 2020 of the East India Region will be headed by Pr. Dr. Asha Ambhaikar who is a senior academician with decades of teaching experiences across the world. This EI Region consists of all the East Indian states including West Bengal, Bihar, Jharkhand, Odisha, Arunachal Pradesh, Assam, Manipur, Meghalaya, Mizoram, Nagaland, Sikkim and Tripura. The International Secretary Kokula Krishna Hari Kunasekaran has delegated his powers of signing the Industrial, Research, University and Academic Institutes Memorandum of Understandings to the EI Region Secretary Vinod M Kapse which needs to witness by the EI Region President Pr. Dr. Asha Ambhaikar. The President of ASDF EI Region for the tenure 2015 to 2020 Pr. Dr. Asha Ambhaikar is a Professor & Dean of Rungta College of Engineering and Technology, Bhilai. She is a chairman Board of studies of Information Technology in Chhattisgarh Swami Vivekananda Technical University, Bhilai (C.G.). She is also a Member of Academic Council in CSVTU Bhilai. She received her M.Tech in Information Technology from Allahabad University and PhD from CSVTU Bhilai, India. The Vice-President of ASDF EI Region for the tenure 2015 to 2020 Pr. Padma Bonde is a Professor from Shri Shankaracharya Technical Campus, Bhilai. She has more than Twenty five years of teaching and research experience in computer science and Information Technology. She received Certification from Thomson Prometric Certification on Websphere Application Developer. She has appreciated from Spoken Tutorial Project IIT Mumbai for outstanding contribution rendered to spread Free and Open Source Software in the state of Chhattisgarh. She received her M.E in Computer Engineering from SGSITS and PhD from RGPV, Bhopal, India. The Secretary of ASDF EI Region for the tenure 2015 to 2020 Pr. Dr. Vinod M Kapse is a Principal & Professor from GyanGanga Institute of Technology & Sciences, Jabalpur. He has more than Fifteen years of teaching experience in Electronics and Communication Engineering and three years research experience in Analysis, Design, Development, testing, and maintenance. He has skills set in Verilog, VHDL, Mentor Graphics Tools for simulation, Synthesis & schematic, Xilinx, Active HDL, ALTERA Quartus-II EDA Tools, Microwind, Tanner Tool, Proteus Keil. Previously he has working as Design Engineer in Sibar Software Services (India) Ltd since 2000 to 2002. He received her M.Tech from G. H. Raisoni College of Engineering, Nagpur, Nagpur University and PhD from RGPV University, India. The Treasurer of ASDF EI Region for the tenure 2015 to 2020 Pr. Dr. Udayakumar P is a Professor & Dean form Central College of Engineering & Management, Kabir Nagar, Raipur. He has more than Fifteen years of teaching experience and more than Fourteen years’ experience in Industry. He has a member in CSVTU Inspection Committee, CSVTU Research Committee and Computer Society of India. He received her M.Tech from CSVTU, Bhilai and PhD in Computer Science & Engineering from MATS University, Raipur, India. The new council has decided to concentrate on University and Government partnerships in establishing Joint Research Activities across the region. ASDF EI would like to give a thrust to research activities across the region by taking up various research studies in all the areas. ASDF EI will also undertake activities to encourage research and innovation within the industry and well as in academia / University. While initiation of ASDF EI Leadership Series will facilitate exclusive interaction between the members of ASDF and industry leaders, at State / National / International level and in turn, provide a platform for exchange of experience and technical know-how, various events will enable the members to get acquainted with the future directions, trends, opportunities and learning across key sectors through lectures by some national & international industry stalwarts. Apart from that a series of learning and development events will also be organized for the senior leadership team of ASDF HQ & EI members such as CFOs / Finance Heads, CMOs / Marketing Heads, HR Heads, CIOs / CTOs / Technology Heads and other key functional heads of the organization. In the mid of 2017 new events are also about to be rolled out which will happen annually at East India region.